A new emerging trend of distribution networks is to use small generating units, known as distributed generation (DG), operating in parallel with the main grid. This kind of distribution networks has enabled DG to support power systems in fulfilling their requirements to increase power output as well as quality of power supply. In order to maximise benefits from the DG system, proper DG planning is necessary. The main purpose of this research is to maximise voltage support through optimal sizing and location of DG. 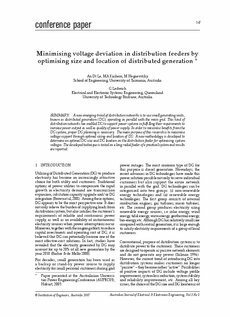 A new methodology is developed to determine an optimal DG size and DG location on the distribution feeder for optimising system voltages. The developed technique is tested on a long radial feeder of a practical system and results are reported.